I brought Finding Cassie Crazy by Jaclyn Moriarty last week - it took me a while to realise it's the same book as The Year of Secret Assignments - yes sometimes I can be a bit dense! It got me thinking about the difference in cover designs for the UK and US editions. 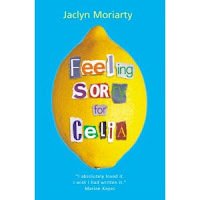 With the exception of Feeling Sorry for Celia I really like the covers (and titles) for the US editions - I don't dislike the UK ones but the US ones really catch my eye - and I like the smiley/un-smiley faces! Also, is there any significance for the lemon/strawberry/cherry on the UK editions? I prefer the UK covers for the first and third ones. But I kind of like the US cover (and title) for the second book better. Oh, but to answer your question about the lemon/strawberry/cherry... I really don't know!